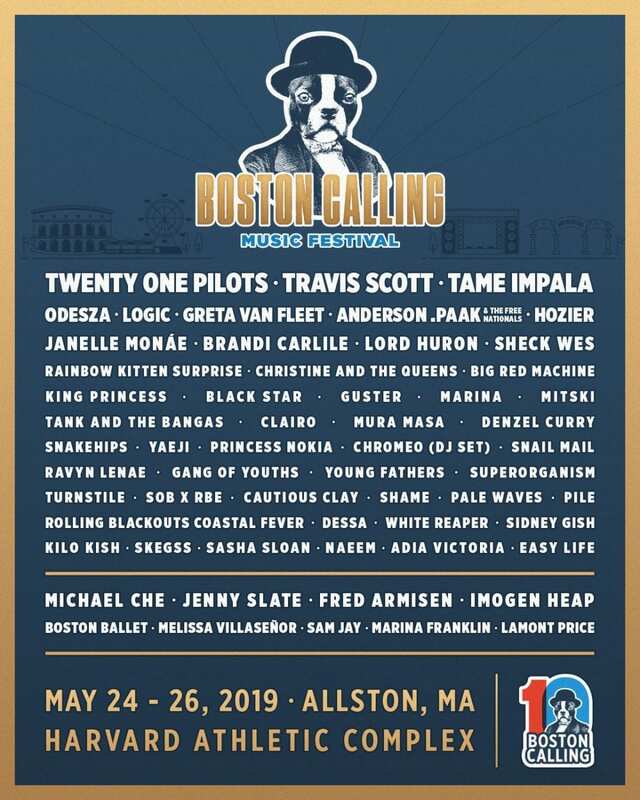 New England’s largest music festival, Boston Calling, will return to Harvard Athletic Complex this May for its 10th edition, featuring headlining acts Twenty One Pilots, Travis Scott, and Tame Impala. The festival is set to take place from Friday, May 24 to Sunday, May 26 in Allston, Massachusetts, found right in-between the busy hustle and bustle of the city. Known for its indie-rock acts in the past, Boston Calling has made a name for itself among the festival scene since its 2013 debut. In 2016, the festival downgraded to only one event per year – instead of one in May and September – yet still maintained a consistent following of around 40,000 attendees. While day-by-day lineups have not been announced yet, Twenty One Pilots is likely to perform on Sunday night, usually the biggest night of the festival. Twenty One Pilots, who performed at the 2014 fall edition of the festival, has since gone on to achieve stardom with 2015’s Blurryface, followed by Trench, which dropped late last year. Travis Scott, who is currently touring in support of his smash album Astroworld, will take the stage, along with Tame Impala, the indie-rockers best-known for their hit record Currents. Hip-hop’s Logic and Anderson .Paak are set to perform, as well as EDM’s powerhouse Odesza, Yaeji, and a DJ set from Chromeo. Hozier, who played at the 2015 festival, will take his spot onstage once again. The indie-rock star known for his platinum single “Take Me To Church” has since released the EP Nina Cried Power in 2018, along with a string of singles. Janelle Monae is also slated to perform throughout the fest; Monae made a comeback last year after a five-year hiatus with Dirty Computer. Some of the most anticipated rising stars to look out for this year are the indie group Rainbow Kitten Surprise, female rapper Princess Nokia, and indie-rock’s Mitski. This past year, Mitski released her third studio album Be The Cowboy, which has been named by multiple music publications as the best album of 2018. Aside from the music across three different stages, Boston Calling offers a variety of Boston’s best food, various initiatives and art installments, along with a giant ferris wheel stationed in the middle of the grounds. Last year, the fest also featured an IKEA Music Lab which included different IKEA furniture for fans to hang-out on while listening to various DJ sets. Check out the full lineup and festival poster below. Look out for the festival’s day-by-day lineup soon. Last year’s festival featured headlining acts Jack White, The Killers, and Eminem. Check out our review of the 2018 fest for Ticket Club.